Since he first came out in 2003, Gavin DeGraw has made music that is timeless. He somehow combines relatable, guy-next-door ease with cool, city-boy charm. He’s romantic and sensitive one minute, random and joking the next. Even with his first album, he’a always seemed familiar, like an old friend. 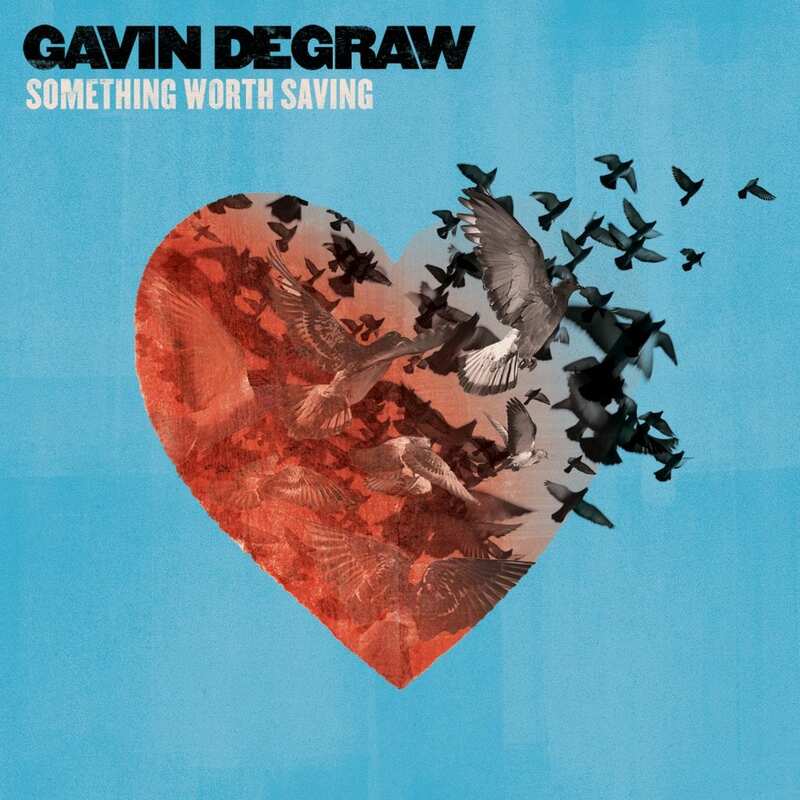 His newest release, Something Worth Saving, is the first album to fully capture Gavin’s many sides. It’s the most colorful, rich collection of songs he’s released yet. And while it’s his most diverse record, it also has his most consistent quality. It would be easy to divide Gavin’s musical career so far into two halves. First you have the down-to-earth crooner accompanied by a piano, acoustic guitar, and little else. Gavin alone wrote every song from Chariot, Gavin DeGraw, and Free, and their simplistic honesty attracted loyal fans. The second half of his career has been a bit more expansive, as Gavin has begun to compose with co-writers rather than on his own. On Sweeter, Make A Move, and now Something Worth Saving, the songs are a bit more slick and fearless. The production is bigger, the songs are more varied, and Gavin seems one step closer to a true pop star. Sweeter introduced a new tone to Gavin’s music, but there was still enough familiarity that longtime fans were comfortable. 2013’s Make A Move continued in this direction, and Gavin broke out of his shell a bit more. There were some unexpected songs on there, like the wild-night “Finest Hour” and overtly confident “Leading Man.” Some moments felt a bit off, but overall it was strong. Something Worth Saving marries Gavin’s two sides seamlessly. It is his most balanced, consistent album, and every single song is exemplary. Even the worst song on the album is great. There are only a couple of piano ballads here, as Gavin chose to expand ever more and try out new moods and genres. The instrumentation is richer and more dynamic, with everything from ukuleles and mandolins to trumpets and strings. Gavin sings about his favorite topic (love), but with some new spins. He deftly balances between emotional tracks and surprising, fun songs. Out of Gavin’s five studio albums (six if you include Free), Something Worth Saving can certainly be counted among his top 3 yet. It’s a stellar album and one that is sure to demand frequent listens. Gavin has finally reached a perfect blend between his musical and thematic side with Something Worth Saving. “She Sets The City On Fire” – The album starts with its first single, “She Sets The City On Fire.” Delicate piano introduces this otherwise radio-ready track. On first listen, it sounds rather pop and energetic (the rapidly sung chorus), but with a few more plays you start to notice the emotion of the verses. The rough edges and details within the choruses also elevate the song. It’s not a standout on the album, but it does prepare the listener for the greatness to come. “You Make My Heart Sing Louder” – Gavin recently identified this second track as his mother’s favorite on Something Worth Saving. It took him the longest to write (he only just finished it the last day before mixing began! ), but all that hard work paid off. “You Make My Heart Single Louder” has a low, soulful, gritty vibe to it that’s reminiscent of his 2013 song, “Every Little Bit.” The choruses are celebratory and give Gavin a chance to shows off some riffing vocals. We’re only two songs in and we already have a highlight on the album. “Kite Like Girl” – Another standout, Gavin shared “Kite Like Girl” a week ahead of the album’s release. It has a sweet, soulful mood that could be compared to the classic “My Girl.” Gavin’s vocals are innocent and light. Strummy choruses get even better with the unexpected tail that connects them back into the verses. This intricate, airy sound suits Gavin well. “Making Love With The Radio On” – Fans also heard this track ahead of the release date. Radio static and soulful “ooh”s start the song before a ukulele-driven verse kicks in. Quirky instrumental flourishes give the song rich texture and dynamism. There’s a loose feeling throughout the song that gives “Making Love With The Radio On” charm. “Harder To Believe” – The fifth song on Something Worth Saving begins with soft piano and strings. You think it’s set up to be a ballad, but as Gavin sings about all the “hell I walked through,” the song gains energy and urgency. He sings intensely on the choruses, his impassioned truth driving the song forward. Fact is stranger than fiction, but Gavin lived to tell the tale. “Say I Am” – Gentle piano slows things down further for this heartfelt ballad. “Say I Am” draws on Gavin’s original style a bit more. While it has his signature honesty and simplicity, a pulsing beat gives “Say I Am” pop credibility. This is the most touching song on Something Worth Saving so far. “How Lucky Can A Man Get” – A punchy beginning instantly interrupts the soothing “Say I Am.” The first of three rather surprising songs, “How Lucky Can A Man Get” is filled with energy and strained, rocking vocals. Horns and a rough edge make this song even more fun as Gavin boasts about the girl by his side. It’s an unexpected song, but one that stands out amongst Gavin’s discography. “New Love” – Another surprise comes from the funky, slick “New Love.” Gavin addresses an ex-girlfriend who wants him back in her life. But his repeated background affirms that she’s “just a little late.” He’s already moved on and found a true love with someone better. “New Love” is fun, funky, and great for those who have moved on and found happiness. “Annalee” – Despite the fun ’60s feel and the handclap choruses, this is no love song. “Annalee” is a cute track about a dishonest girl. Everyone else seems to fall for her lies, but Gavin is calling her out. It’s not the romantic ode you may have anticipated, but it is a song that will get you singing and clapping along. “Something Worth Saving” – The final song is the worthy title track. “Something Worth Saving” is the lovely piano-vocal ballad we’ve been waiting for, starting slow and gradually growing by the second verse. Gavin sings about getting through all the fights and troubles. When you’ve been through a lot and have something (or someone) worth saving, keep holding on. Mandolin and lush strings add to this swelling, emotional ballad. You can buy Something Worth Saving on iTunes now. I did not think this was his best work. I was disappointed because the songs just sound like they have no soul. In his previous work the songs were WAY better and soulful, I loved them so much.